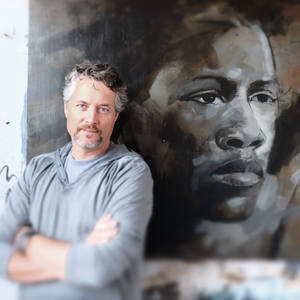 Based in Toronto, Canada, Anthony creates large, bold portrait-based (and the occasional landscape) paintings. Working in multiple layers and sessions, he creates works that go beyond the literal, creating something more compelling - somewhat abstract yet familiar. His paintings pay homage to sound drawing combined with a love of abstract and textural elements. The paintings explore the human condition through the face and its universal expressions. Each face tells a story. That story is different and personal for each viewer. Featuring bold, expressive brushwork, abstracted from their original source, most often photographs - the works draw the viewer in and evoke an emotional response. After graduating from the Ontario College of Art (now OCADU) as an Editorial Illustrator, Anthony embarked on a successful career in the design communication field. The passion to paint was re-ignited and he has been busy in the studio creating new works over the past few years.